This Federal style building has two stories, an asphalt shingle roof and has been altered. It has brick construction laid up in Flemish bond and a front gable roof with eave returns. There is a gabled entrance canopy with large scroll sawn support brackets and pendants in Italianate style (early addition). There is an intact wood front door and large brick front and rear wall chimneys. It has an oval vent at attic level and limestone window lintels. There is a recessed right side ell with cross-gable roof and with a 2nd entry. The foundation is stone, there are 12 over 12 windows and authentic wood blinds on the second floor windows. 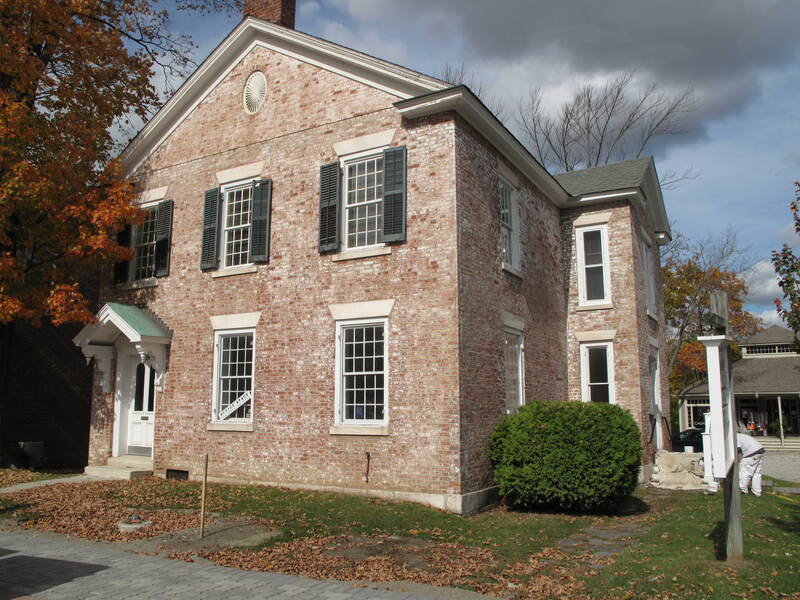 This is one of the few brick vernacular houses in Lenox, and one of two to survive from before 1850. 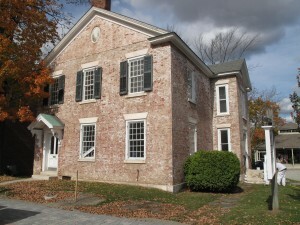 It is predominantly a Federal style house, with 12/12 window sash, spalyed (sic) stone lintels and other characteristic features of this style, but the gable-front form of the building is a hallmark of the Greek Revival style, just emerging in the 1820’s. It is possible that this house was influenced by the Classical Revival Second County Courthouse of 1815, which used the temple-front form. This house would have been among the most substantial and fashionable in Lenox in the first three decades of the 19th century, and reflects the prominent position the Washburn family held. This was the Washburn homestead, probably build by Jacob Washburn, who married the daughter of Samuel Northrup, an early settler in 1786. Jacob was a prosperous farmer with a large family and it seems likely that he built the house after establishing himself in Lenox. He died at age 62 in 1828, but his wife and children survived him and continued to prosper. His children and grand-children became some of the largest property owners in Lenox. The house remained in the Washburn family through the nineteenth century. Mrs. Thomas Morse was the last Washburn to own it. Charles T. Schulze has been the owner since November 22, 1983.